And they’re using it to sell products like the $13 rock pictured above. See here. 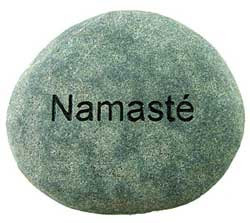 And check out this $45 Namaste mat. I’m sorry but this is an outrage. Can you imagine taking spirituality and turning it into commerce? Apple lawyers are going to be all over these flaky froobs for stealing our idea.